Banchory Beavers’ William Storer was crowned a double national champion as South Aberdeenshire excelled in the Scottish Age Group Championships at Tollcross International Swimming Centre in Glasgow last week. Beavers swimmers were part of the South Aberdeenshire Swimming (SAS) team, who had an outstanding competition, qualifying for ten finals and bringing home five medals. It was a long five days of competition and the team did really well against the best swimmers in their age group. William swam in the age 14 category and had a fantastic meet in making seven finals and winning five medals. 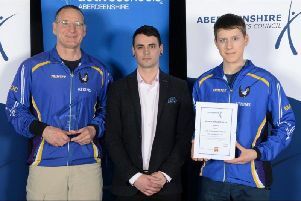 He also became the Scottish national champion for 2019 in the 50 and 100 metres freestyle events – an amazing haul for a small club run by volunteers. South Aberdeenshire Swimming is made up from four clubs: Banchory Beavers ASC, Westhill ASC, Stonehaven ASC and Upper Deeside ASC.